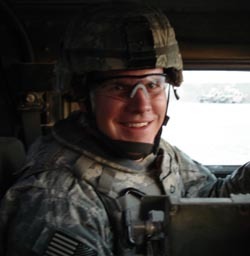 Gregory "Shorty" Millard, son of Kevin Millard, the owner of California Bicycles in La Jolla, Calif., was killed on May 26 in Salah Ad Din Province, Iraq, when an improvised explosive device detonated near his vehicle. "Dear American Public - On the 26th day of May, 2007 I and my wife & family along with Gregory's Brother, lost our son/brother in Iraq. As a business owner here in La Jolla, CA for over 30 years and one with family ties throughout the USA. I and my wife have worked within the Southern California Community to offer our children a better future. Our Son, Corporal Gregory N. Millard could have been or done anything he wanted, but after 9/11 and when age permitting he instead volunteered for military service. Enlisting not in a simple field but in the toughest unit the US Army has to offer. He became a member of the elite 2nd Battallion, 505th Parachute Infantry Regiment, 3rd Brigade Combat Team, 82 Airborne Division. Growing up in San Diego he was known for his kindness, smile and sense of humor. Never meeting a person he didn't like always leaving one with a smile, no matter the day's troubles. He died at the hands of cowards using an IED along with others in his unit. Our immediate family and extended families have a long history of war veterans dating back to the Civil War. Our son, is truly an American Hero with Bronze Star W/Cluster, Purple Heart, 15 decorations in 2 1/2 years, please never, ever let America forget what we and our son have sacrificed so that they may speak freely." A website has been set-up to honor Gregory at www.armymillard.com. In addition, on behalf of Gregory, the Millard Family has established a Foundation to help support his Army Unit: 2nd Plt, A Co, 2/505 PIR Airborne Division. The Foundation will supply the soldiers with critical safety equipment above and beyond standard issue.